This traveling exhibition is organized by Zeuxis, a New York-based association that explores the contemporary possibilities of still life painting. â€œTabletop Arenas” presents both traditional and unusual configurations of still lifes as portrayed by Zeuxis' 24 member artists (including Ying Li, associate professor of fine arts at Haverford), as well as invited guests Lennart Anderson, William Bailey, Ken Kewley, Gabriel Laderman, Susannah Phillips, Langdon Quin, and Sandra Stone. The artists pursue diverse philosophies and styles, but all share an interest in the aesthetic and formal possibilities of the still life. The works reflect individual encounters with everyday sensations, informed in different ways by a 400-year tradition. Accompanying the exhibit is a 36-page catalogue with color reproductions of the paintings and essays by Zeuxis artist Joseph Byrne and writer Thomas Disch. 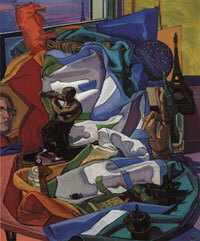 Byrne will also give a talk Thursday, February 3, at 4:15 p.m. in the Cantor Fitzgerald Gallery. Located in Whitehead Campus Center, the Cantor Fitzgerald Gallery is open 11 a.m.-5 p.m. Monday-Friday and noon-5 p.m. Saturdays and Sundays. For more information, call (610) 896-1287. For artist biographies and more images from the exhibit, visit the gallery online at www.cantorfitzgeraldgallery.org.